The tone of the Wavedrum Mini responds to the location at which you strike the pad, and the amount of force applied, moving beyond a one-dimensional sound. The pad responds sensitively to every aspect of your strike – open shots, slap shots, and more – allowing for a range of sophisticated performance techniques and complex musical expression. The Looper function lets you record and playback your Wavedrum Mini performance. Plus, you can add an unlimited number of overdubs, creating complex, multi-sound patterns. (Total record length is limited to 25 seconds). Play along to these complex patterns in real time to create fascinating performances, without the need for any other equipment. 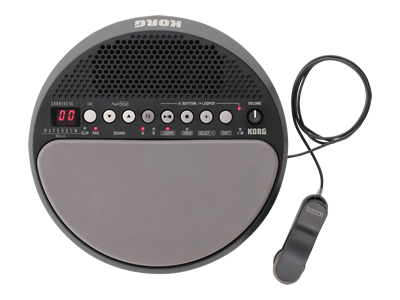 The Wavedrum Mini features built-in effects that make it easy to transform the sound itself. Each of the 10 high-quality multi-effects combines a variety of effects – familiar spatial-type effects such as delay, chorus, and reverb; modern effects including filters and pitch-shifters that radically transform the sound; distortion-type effects that deliver analog-style warmth, etc. Any effect can be quickly applied to any sound, regardless of technical knowledge, allowing you to create exciting musical results. The Wavedrum Mini contains 100 rhythm patterns covering a range of styles. These patterns can be used as a guide to help the beginner keep a steady rhythm; or simply enjoy jamming along. In fact, by using the pad, the sensor clip, and playing a rhythm pattern, you can create a three-part performance in real time.